Guys, it has been one productive week! I managed to go to the doctor, see the dentist, apply for my passport, look at condos, blog for a whole week while maintaining my 9-5 gig. If that doesn't make me feeling like Superwoman, I don't what will. This week's Currently Craving is a little bit different because I actually ended up purchasing most of these items. My biggest obsession right now is the Beachwaver S1. I went from never doing my hair to literally curling it nearly every. single. day. Now, that may sound like a lot of effort, but let me tell you, this curling iron cuts my time in half. I have A LOT of hair, and what used to take me an hour to curl it now take 20 minutes tops. Can you say lifesaver? 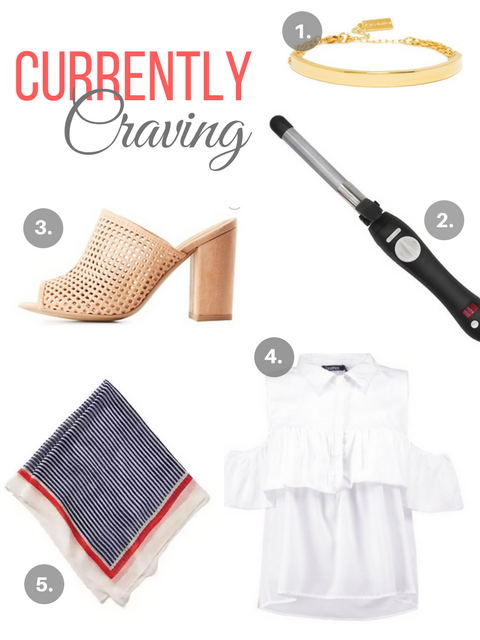 Which items made it on to your shopping list this week?! Love those perforated mules! Such a staple for spring - they could be paired with anything!